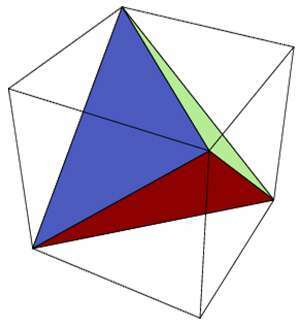 A tetrahedron is a polyhedron composed of four triangular faces, three of which meet at each corner or vertex. It has six edges and four vertices. Macromolecular science will have to add a new giant molecule to its lexicon thanks to new and cutting-edge polymer research at The University of Akron. The research team led by Stephen Z.D. Cheng, professor at UA's college of polymer science and polymer engineering, invented a new thinking pathway in the design and synthesis of macromolecules – the backbone of modern polymers – by creating an original class of giant tetrahedra. Major technological advancement is largely driven by the discovery of new materials, and this work opens up an entirely new direction of research. The work has been done in collaboration with researchers at Peking University in China and The University of Tokyo in Japan. In creating a brand new field of study in macromolecular science, their findings are published in the April 24, 2015 issue of Science magazine. The unique challenge of building macromolecules is to keep their material-specific properties. This requires the ability to create material designed and engineered at the nanometer scale for a specific task. Cheng and his team asked themselves, "What kind of structures do we need to transfer and amplify microscopic functionalities to macroscopic properties?" Building on earlier work on giant surfactants, which the National Science Foundation began funding in 2009, Cheng and his team worked to development a new class of giant polyhedra. These precisely functionalized nanoparticles were achieved by extending the molecular geometry from traditional one-dimension categories of giant surfactants to three dimensions of tetrahedron shapes that are the simplest to use. "It had never been done before in soft matter, where it's engineering could be particularly useful," explains Cheng, "and it took 3 years to design and synthesize." Since these new giant molecules are precisely and manually controlled and designed, their discovery provides great opportunities to construct new building blocks with atomic precision. "Because of the 'click' synthesis, this system is highly tunable in terms of core structure, nanoparticle functionality, and feature sizes," describes Cheng. The concepts and formation mechanisms of these supramolecular structures could be extended to other giant polyhedral molecules with different topologies and chemical compositions, giving scientists a new way to think about answering the question, "How can we organize molecules into ordered complex structures?" Here is a schematic illustration of the A15 phase. Their research progression can be recapped in three basic phases. Using computational and data-driven approaches, Cheng and his team first designed and synthesized giant tetrahedra by introducing different functionality at the tetrahedral vertexes to generate precise positional interactions. Then they found a selective, multi-step assembly process of these giant tetrahedra resulting in highly ordered supramolecular lattices including a Frank-Kasper A15 phase at a nanometer scale. Finally, they observed the structure lattice in real space of the Frank-Kasper A15 phase under transmission electron microscopy, which in and of itself is a novel action. This new class of hybrid materials covers the development of a diverse range of novel applications. Cheng's team is working with professionals from a wide variety of fields, asking, "What problem requires solving? What do you need?" This process helps to ensure the material can be used to create commercially viable solutions. Cheng foresees that this new giant molecule can deliver a previously unexplored examination into a new class of advanced functional materials with innovative electric, magnetic and optic functions. "For example," says Cheng, "we are currently exploring the intriguing functional properties of light ceramic materials with soft-matter characteristics, often called 'soft-ceramics.' These structures exhibit certain mechanical elasticity as opposed to the brittleness of common ceramics."